Input cells: A typical and widely accepted format for this is a pale yellow background, sometimes with a blue font colour. Some practitioners like to add a dashed border to further increase user awareness of input cells. 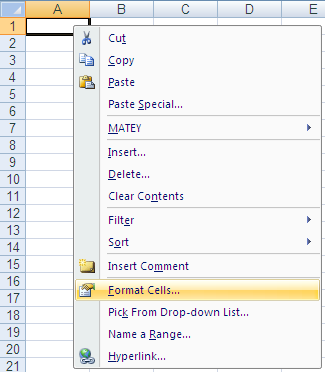 Calculated formulas in general: Most cells within your model will be calculated formulas. Therefore, you should stick to a simple formatting that is eye- and printer-friendly. Usually, this will be black on white - or sometimes blue on white, if input cells do not use a blue font already. Percentages: Commonly, percentages (both calculated and input) are put in italics. Sums: It is very common, not only in financial modelling, to represent sums in bold, sometimes with lines below and/or above the row. Checks: The checks included in your model should be highlighted in some form, especially when they indicate errors. The article "Excel: Using Checks" provides some more guidance on checks. Of course, you can define more specific formats. For example, you could show historic and budgeted/forecast figures differently. However, you should be careful not to use too many formats in order to reduce complexity. I have found it useful to define colours and designs globally - preferably on a company level, but at least at the beginning of a project for all team members to agree upon.